Take an experience of the countryside of China and gain exposure to various aspects of daily life. 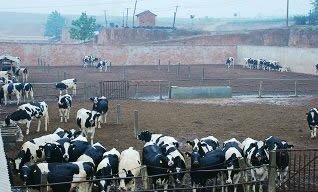 We will pick you up from your hotel in Xi&apos;an and our first stop is a traditional Chinese dairy farm where you will see how dairy and other cow production is carried out. Afterwards, you will visit a village medical clinic. It can be quite eye opening to see how rural villages conduct their medical procedures and how their venue is set up. A Yaodong cave-house in Anwu Village will be your next stop. This is a dwelling that is carved out of a mountainside or hillside. These types of homes only exist in China and are still surprisingly common in central and northwest China. The structures generally have a rectangular base for the living area with a half circle roof area right on top. The benefit of these Yaodong dwellings is that temperature is kept relatively stable; it is cool in the summer and warm in the summer. One family unit usually has 3 arched openings and areas and all are connected inside. Some Yaodongs are even used to raise animals! Often once inside, it is hard to tell you are even in an earthen residence aside from the fact that there are no windows. Pass by some other authentic areas of Anwu Village. A local school here will show you firsthand how Chinese education works in the countryside. Note the conditions of the schoolhouse and the resources that the students work with. A historic theater building brings forth the arts of the Chinese countryside, revealing one more aspect of daily life and culture in Anwu Village. Lastly, you will visit the Army Military School to learn about the armed forces life which is different than what you would find in a larger Chinese city. Lunch will be enjoyed at a restaurant at the village. Transfer back to your hotel later.